Since we published our article Best Laminate Flooring – Pros & Cons, Reviews and Tips we’ve had a number of comments from homeowners, some for and some against using laminate flooring in the kitchen. So what’s the truth when it comes to laminate kitchen flooring? Let’s look again at the main pros and cons of installing laminate floors in the kitchen and consider the smart buying options and tips. 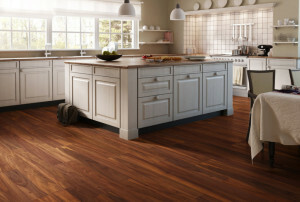 When considering flooring for the kitchen, laminate is a popular choice for those who want an aesthetic upgrade from vinyl sheet flooring but have a limited budget for the project. That’s a good place to start with the advantages and disadvantages of laminate flooring. For further analysis of the pros and cons of laminate vs other home flooring options click here. AC1 – Moderate residential: Light traffic areas in the home, for example, bedrooms. AC2 – General residential: Light and medium traffic areas, for example, living room, home office, dining room. AC3 – Heavy residential / light commercial: All traffic areas in the home and light-traffic commercial areas. AC4 – General commercial: All residential areas and moderate commercial traffic. AC5 – Heavy commercial: All residential areas and high-traffic commercial floors. Laminate with an AC rating of 3 or higher will give you added protection against dropped items, kids toys, sliding chair legs, the nails of large dogs and other causes of dents and scratches often found in the kitchen. HPL construction method: Better grades of laminate flooring typically undergo high-pressure lamination (HPL) which serves to compress and fuse the layers more effectively than older methods. HPL manufacturing results in a harder, more stable and more durable floor. Thick wear layer: This is where good laminate flooring is truly separated from cheaper grades. A layer of very-hard melamine or similar material is fused to the photographic layer (or wood veneer layer in some newer products) to create a tough surface. The wear layer must resist scratching and dulling and be thick enough to provide many years of protection without wearing through. While it might be difficult to get information on the thickness of the wear layer, it is safe to say that the higher the AC Rating and the thicker the flooring is as a whole, the better the wear layer will be. The right underlayment for the location: A moisture barrier is important when installing laminate over concrete. A sound muffing underlayment is advised when the floor is installed above living space. Foam underlayment helps to insulate the floor and retain its warmth. There are other options too, and each type is available in several grades. There are also laminate flooring products with underlayment already attached which saves a step in installation. Your installer is the best person to help you determine which one is the right choice for your laminate kitchen flooring project. An experienced installer: The very important choice of who installs the floor is often overlooked in picking out the style and quality of the laminate. For this reason, it makes sense to select the installer yourself rather than leaving that decision to a general contractor or interior designer. You’ll get the best results when you request estimates from at least three qualified laminate flooring installers and interview each one about the experience of the crew that will be doing the work. If you’re thinking of a DIY installation make sure you have the tools and are comfortable with cutting laminate floor planks/tiles.